Roughly 40 species of passion vine butterflies exist worldwide, all belonging to the genus Heliconius. So called because their larvae exclusively eat the vines of passion flowers, these butterflies have been widely studied due to their divergent coloration and their interesting behaviors. Although each species has different traits, they're similar in several ways. While all species of passion vine butterfly have their own distinct physical characteristics, members of this genus look alike in several ways. They're known to have long antennae, large eyes, teardrop-shape hind wings and a generally elongated wing shape. Also characterized by a huge diversity of color patterns at both species and subspecies level, these butterflies engage in Müllerian mimicry. This is where different species may develop a common wing pattern while living in the same area, with the intent of avoiding predation. 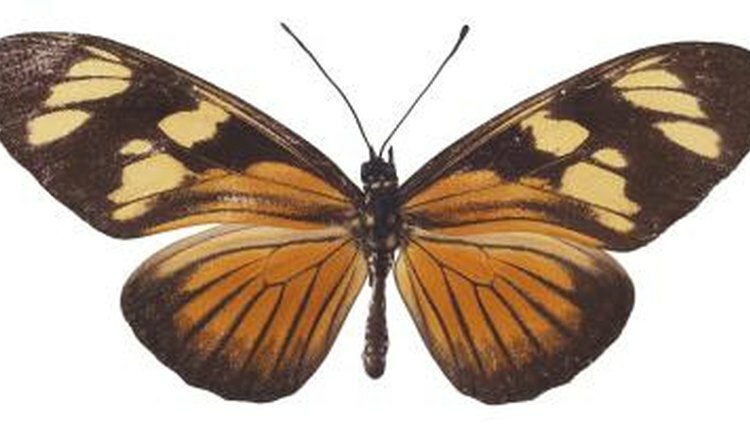 Groups of butterflies with the same pattern are known as mimicry rings. An unusual trait in passion vine butterflies is that they eat a large amount of pollen. Most adult butterflies eat some nectar, but many others eat nothing at all. It's thought that the pollen-eating ways of Heliconius butterflies could be the reason they live for a relatively long time -- roughly 8 months -- in the wild. Their primary food sources are plants in the Cucurbitaceae -- or gourd -- family, especially members of the genera Psiguria -- known as pygmymelons -- and Gurania -- known as jungle cucumbers. They're major pollinators for these plants. They'll often decide on which area to live in according to the amount of pollen-bearing plants in the vicinity. Passion vine butterflies tend to live only in warmer areas. They're widely distributed across southern parts of the U.S., Central and South America and the West Indies. The largest number of species belonging to this genus live within the Amazon basin. Different color forms follow a geographic pattern, and it's thought that these mimicry rings change every 100 to 200 miles. These butterflies usually live within small home ranges, where they know they have the appropriate resources. Although not all passion vine butterflies engage in pupal mating, at least 18 species are known to do so. This is a practice in which males choose mates while they're still in pupal form. When the pupal females are close to breaking out of their cocoons, the males come and perch on them. They may even insert their abdomens in through the cuticle close to the females abdomens. As soon as the females break out from their cocoons, the males are there to mate with them. The same males will also court mature females.